We are now ofering UV densitomery services. 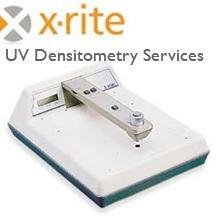 Accurate UV densitometry for calibrating your contact printing process is done on our X-Rite 361T densitometer. Ortho readings are also available. Priced for 11 steps, 21 steps and 51 steps. Please print out two IDENTICAL wedges that you need tested. Steps should be no smaller than 1/4" square. Send us one of the wedges in the mail in a rigid light tight envelope and retain the other for your reference. We will e-mail you the densities and will keep the printed wedge for our records. Please indicate on your film which type of reading you need, UV or Ortho. Testing in both modes will double the step tests and cost. Please use these calibrated wedge links below for printing densitometry test wedges.